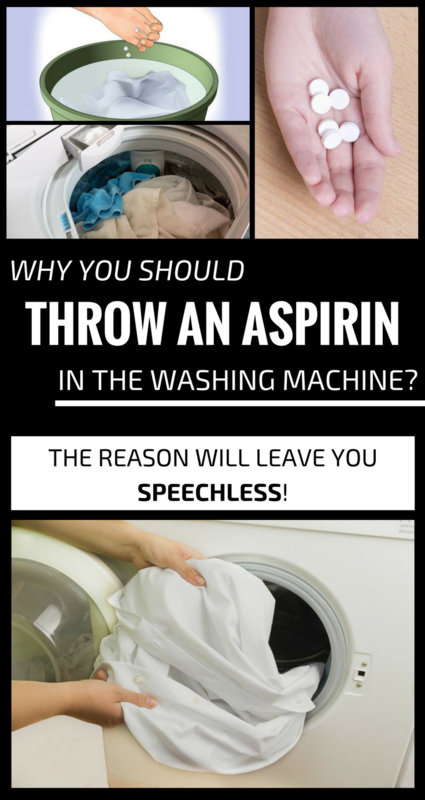 Why You Should Throw An Aspirin In The Washing Machine? The Reason Will Leave You Speechless! Do you use aspirin when washing clothes? It may sound strange to you, but it has benefits that you didn’t even know. That’s why you have to throw an aspirin in the washing machine every time you wash your clothes, especially the whites. Aspirin is used for white laundry, very helpful to remove unwanted stains, and to maintain and prolong the life of clothes. Just by adding an aspirin in the washing machine you will no longer have to worry that your clothes will lose their aspect in time. Also, it is very gentle with the fabric. To regain the white color of your clothes, just dissolve 5 aspirin tablets in 7 liters of water and soak the clothes in the solution. Let them stay in this solution overnight. The next morning, put the clothes in the washing machine with a few aspirin pills at the usual program.